Another success for year at the Sturgis Buffalo Chip with a concert lineup and event schedule that was second to none. You can't get this experience anywhere else! The Sturgis Buffalo Chip® has closed the books on yet another successful Sturgis Rally. The 2013 Motorcycle and Music Festival delivered nine days jam-packed with world-class concerts, outrageous contests and death-defying stunts to bigger crowds than the Sturgis campground had ever seen before. Buffalo Chip festivities were off to a roaring start with the August 2nd return of Friday Fest, the campground’s colossal Sturgis Rally pre-party. The bash delivered an eclectic 12-hour mix of music to the main stage from six of the Chip’s showcase performers along with heavy metal legends, Queensrÿche. The sixth annual Legends Ride® on Monday, August 6 hosted some of the biggest names in television, film, music and motorcycling along with riders from around the globe. The philanthropic event included such celebrities as Dee Snyder of Twister Sister, Pat Simmons of the Doobie Brothers, Jim “Hacksaw” Duggan, Robbie Knievel and Paul Teutul Sr. of Orange County Choppers. The Ride that Rocks™ escorted participants from the Silverado Franklin in Deadwood through Vanocker Canyon, back to the Sturgis Buffalo Chip® where participants were treated to a catered reception and riders-only auction. All together the event raised $81,490, which the Buffalo Chip presented to Black Hills Special Olympics and the Sturgis Motorcycle Museum and Hall of Fame. Legends Ride® participants, along with droves of Sturgis Rally-goers, packed the amphitheater for Monday’s electrifying main stage performance by Kid Rock. The American icon’s concert went off without a hitch, despite its concurrence with one of the biggest thunderstorms to ever descend upon the Sturgis Rally. The concert was filmed in its entirety for CMT’s “Kid Rock: Live from Buffalo Chip” special, which aired Thursday, August 22, 2013. The Buffalo Chip celebrated with women of motorcycle fame during Biker Belles ride on Tuesday, Aug. 6. The celebration began with an inspiring symposium of leading industry women, then lead a group of celebrities and riders on a guided ride from the Lodge at Deadwood to the Buffalo Chip. Participants on the ride were also treated to a catered reception and riders-only auction that raised funds for Helping with Horsepower and the Sturgis Motorcycle Museum and Hall of Fame. All together Biker Belles raised $36,520. Some of the world’s most daring stuntmen risked life and limb during the first ever Daredevil Wednesday. Anxious Sturgis Rally crowds waited with bated breath at the CrossRoads at the Buffalo Chip® to witness death-defying motorcycle stunts including Tim Dyson’s passenger backflip stunt, Juli Moody’s Human Link stunt, unimotorcycle drag races and Clint Ewing’s attempt to travel down a 360-foot tunnel of fire. The Sturgis Buffalo Chip spent Thursday, Aug. 8 honoring our members of nation’s military in its annual Freedom Celebration. Guests spent the day paying tribute to fallen soldiers in the Sturgis campground’s Field of Flags and at the Veteran’s Memorial Wall. The patriotic rock group, Madison Rising, kicked off the events on the main stage with their rock rendition of the Star Spangled Banner. Freedom Celebration events in the amphitheater also included a parade appearance by the Budweiser Clydesdales and a moving ceremony honoring two fallen Benghazi soldiers. The Sturgis Buffalo Chip has already begun its plans for its 33rd annual Motorcycle and Music Festival, with band announcements coming soon. For more information visit http://www.BuffaloChip.com and make reservations for 2014 at discounted rates now. 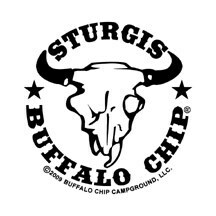 Family owned and operated, the Sturgis Buffalo Chip®, the Sturgis Rally’s cornerstone event known as the Largest Music Festival in Motorcycling™ and The Best Party Anywhere™, just celebrated its 32nd annual concert series. One of the few remaining independent music festivals in the world, this famed creek-fed 580 acre camping resort three miles east of Sturgis, SD has provided nine days of epic live music experiences and exciting activities for fans from around the world since 1981. Concerts are free with camping. Passes grant access to music industry's hottest stars, the Bikini Beach swim paradise, 25 bars, mouth watering food and beverage vendors and thrilling exhibits. The Sturgis Buffalo Chip offers clean, well maintained facilities, private showers, cabins, RVs, paved roads and more. Outrageous events such as unforgivably hot bikini contests and jaw-dropping daredevil stunts are a few of the many daily spectacles unique to the Chip. The Buffalo Chip is a festival experience like no other. More details are available at http://www.BuffaloChip.com.